Post subject: The AzBaja.com Westside Meeting! Post subject: Re: The AzBaja.com Westside Meeting! Great meeting and turnout! Thanks to Lundes for having this we really appreciate it! This was my first Lundes meet & it was really cool seeing all the different VW's in one spot. Glad I could make it out again, it was good seeing everyone & getting to recognize some faces. Meeting this Friday. Who's going? I am going to the meeting but my car is still down waiting for EMPI spindle replacement. This Friday, March 1st at 6:30pm. Lundes VW on West Bell Rd just off the 101. I'm planing on going. Unless somthing else stops me. So bring you money I will have a box of shirts. I will be there with $$$ in hand. Another fun night and some nice cars. Conundrum(1) Reggie(2) biblethumpncop(1) xzeller8(1) dirtjunkie(3). I have your new azbaja.com shirts. Drop me a pm to arrange a pickup/dropped time. Xxl to xxxl shirts are $22 all others are $20. Azbaja (Eric) will be at the Lundes vw show on Friday April 5th with more shirts if needed. Heads up for the Westside guys. The Lundes VW get together will be Friday April 5th. This event gets bigger each week. Hope to see everyone there. 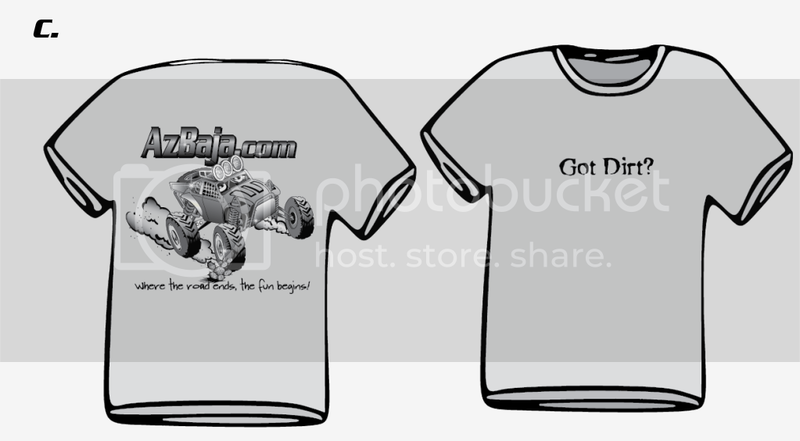 The NEW AzBaja.com shirts will be there if you are interested in one or more. If you need a specific size contact Eric (AzBaja) so he can bring your size along. There are three shirt color options as well. Sounds like fun, unfortunately I can't do Fridays. I'm usually down there on Saturday's however. As a matter of fact I'll be at 67th and Bell this Saturday, usually drive a classic down. Too bad this isn't on a Saturday, I'd swing over to meet some people. I currently do not have a car to take, but I will be there around 6:30 or 7. Hope to see a lot of bajas at the show. We will be there. Alyssa and I again for another round. [ Go to page: 1,	2	] 18 Dirtjunkie 6700 AzBaja Playday 2017?